Bryan Preston and I are pleased to announce that our manuscript "Practicing GIS as mixed-method" is now forthcoming at the Annals of the Association of American Geographers. A preprint copy is available here. Preston, Bryan, and Matthew W. Wilson. forthcoming. "Practicing GIS as mixed-method: affordances and limitations in an urban gardening study." 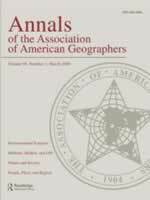 Annals of the Association of American Geographers. Geographic information systems (GIS) represent more than a tool for spatial data handling. Qualitative and mixed-methods approaches with GIS value the suite of spatial methods and technologies, while typically showing a marked sensitivity toward issues of subjectivity, knowledge-production, exclusion, reflexivity, and power relations. And although recent research in the use of qualitative GIS demonstrates the ways in which spatial representations and analyses can be used as part of critical geographic inquiry, there remain significant opportunities to demonstrate and synthesize the particular affordances of these approaches. Alongside broader developments in public scholarship and the digital humanities, mixed-methods research with GIS is coming of age, as technological innovations are easing access to data and access to visualization and analytical tools for some. However, the implications of these developments at the level of knowledge construction within community-based, critical research have been underexplored. What are the specific affordances of mixed-methods research with GIS? How are mixed-methods knowledges made and worked through community-engagement? Here, we trace how qualitative GIS methods uniquely enable multiple narratives to change the ways in which GIS is practiced. To illustrate this process, we present findings from the use of qualitative GIS to study urban gardening in a postindustrial, Midwestern city.